Visual Studio Code>Programming Languages>cljfmtNew to Visual Studio Code? Get it now. This extension is a cljfmt wrapper to provide document and range formatting. 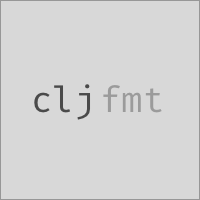 cljfmt.indentation - true if cljfmt should correct the indentation of your code. Defaults to true. cljfmt.insertMissingWhitespace - true if cljfmt should insert whitespace missing from between elements. This will convert (foo(bar)) to (foo (bar)). Defaults to true. cljfmt.removeSurroundingWhitespace - true if cljfmt should remove whitespace surrounding inner forms. This will convert ( foo ) to (foo). Defaults to true. cljfmt.removeTrailingWhitespace - true if cljfmt should remove trailing whitespace in lines. This will convert (foo) \n to (foo)\n. Defaults to true. If you are looking for a Clojure & ClojureScript programming environment for Visual Studio Code, it's a good idea to check Calva and the other extensions. If you already have Calva installed, please be aware that formatting may not work properly since both extensions will try to format your code.